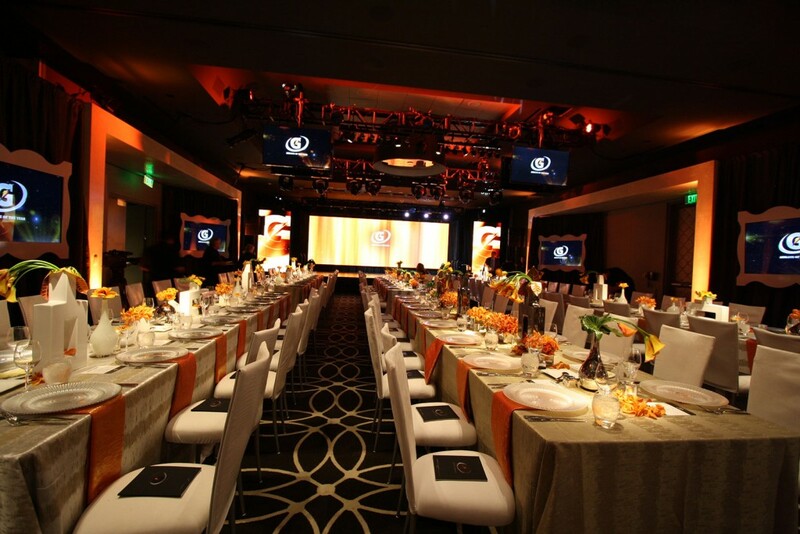 The setting for the event was at the W Hotel Hollywood on July 16, 2013 in the Great Room for 210 guests. 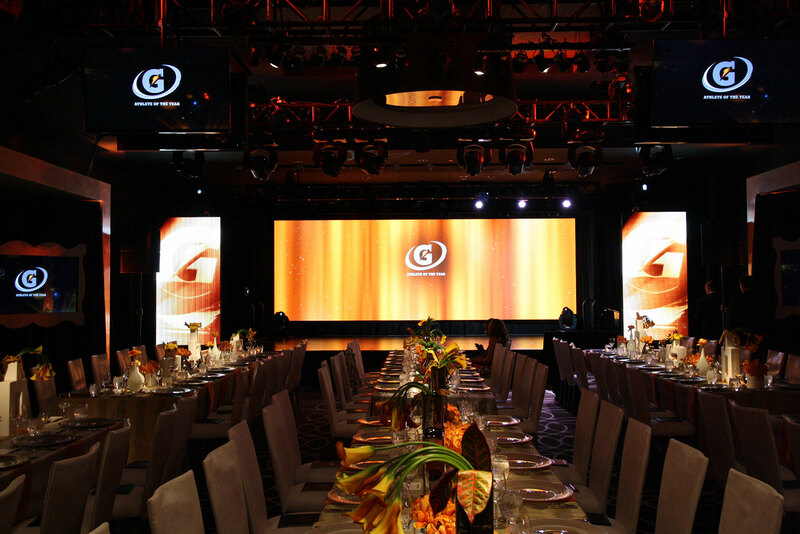 It was a national awards event that included cocktails, formal dinner and an awards presentation, which was being filmed for television quality production. These annual awards are an institution for the client’s brand and winners alike. Past winners of the Athlete of the Year have gone on to successful careers in the professional sports world. With household names such as Kerri Walsh, Peyton Manning, and Kobe Bryant on the past winner roster, you can understand that winning this award is a big deal for up and coming athletes. Seniors in high school from twelve different sports nationwide are selected on the basis of athletic achievement, academic excellence, and exemplary character (including sportsmanship, and participation within their community and other activities) and the program culminates at this event where one female and one male athlete are awarded the National Athlete of the Year title. The program is administered by ESPN’s RISE and is a franchise for the client’s brand. 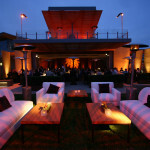 The evening is an all VIP Who’s Who of the Sports World event. 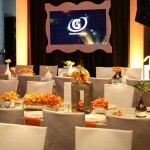 Our role in the event was that of creative design agency. 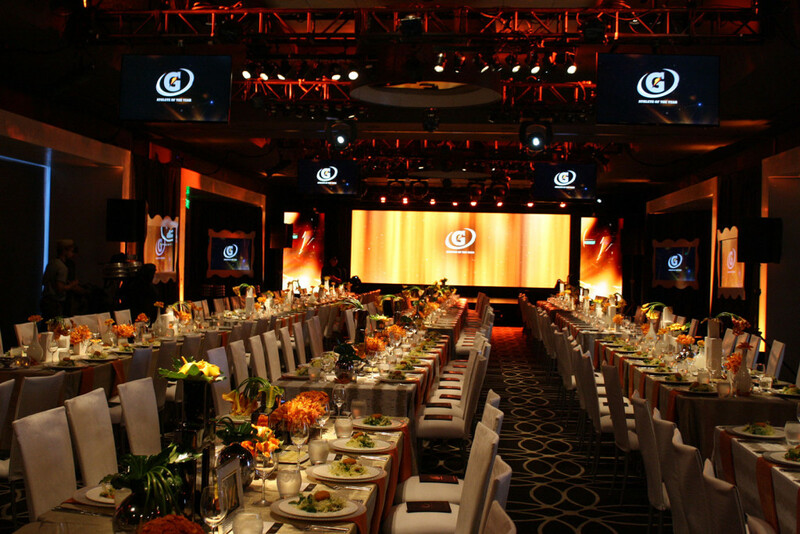 It entailed collaboration with the technical producer to create an environment that allowed for a mixed bag of media messaging, live event experience and television production quality filming. Ordinarily held in a large ballroom with high ceilings and lots of space play with, this year’s venue in the Great Hall at the W Hotel in Hollywood was long and narrow with low ceilings that presented us with a tunnel-like space. It would require strategic design to create an inclusive experience and keep attention focused on the stage where we needed it to be. 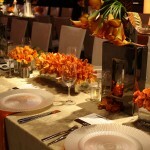 The look and style also needed to deliver an exciting and unique experience that honored the attendees. Mixed with television production, our task became a little more complex. Normally, in television filming, there is not a 360-degree environment. If you’ve ever been to the Grammys or Oscars or other live televised event, you realize that what you see at home on television is not the same experience as when you are present at the event. Filming aspects brought a new level of consideration that have great impact on the buttoned-up looks we experience at a normal event. All lines had to pull to one point. No ceiling could be in any of the camera shots. Additionally because of the low ceilings, the audience would be a major part of the shot and therefore a part of the show. Everything including the audience had to be considered in the design. Television and events are two different animals. 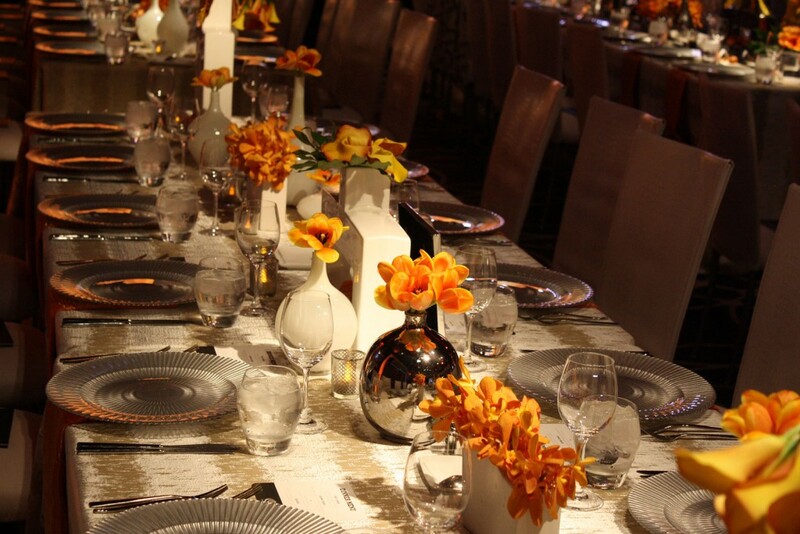 Our team handled every element of the event that was décor driven, including fabric draping, floral design, technology integration and overall environment and tabletop styling. All combined, our role provided for a well-branded event with a sophisticated style that allowed both worlds to coexist perfectly. Working together with the technical team to create the focal point for the space, a stage was constructed at the long end of the room from a huge horizontal LED screen bookended by two vertical screens. 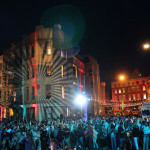 It covered the front wall from side to side and provided a canvas for both digital media and a changing scenic backdrop. To make the room look ahhh-mazing, the team embraced the compact size of the room and approached the design as if it were a sound stage. 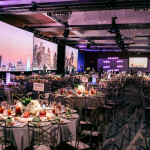 The infrastructure of the room was constructed using a trussing grid that all technical, lighting and drape elements were flown from providing a sleeker look. Large LED screens were also flown overhead to provide even more viewing points for the stage. In between white marble door arches, grey drape provided a blank canvas. 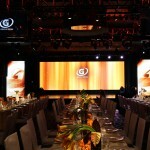 Next, floating Hollywood Regency styled frames with LED screen inserts were overlaid on top of the drape and flown from side truss structures for even more viewing points. No matter where a guest looked they had an option to see the action on stage. 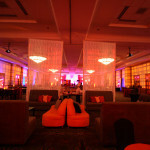 Walls were washed with orange amber while vertical architectural details were lit in a vivid orange (the client’s brand color) to create dimension and contrast. 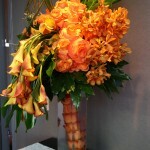 Working with such a powerful shade of orange, meant it needed a base color that would really make it POP yet retain an elegant feel. 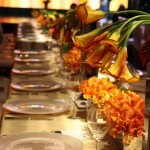 Champagne gold, silver and cream were decided upon to create a neutral, yet interesting and textured palette. 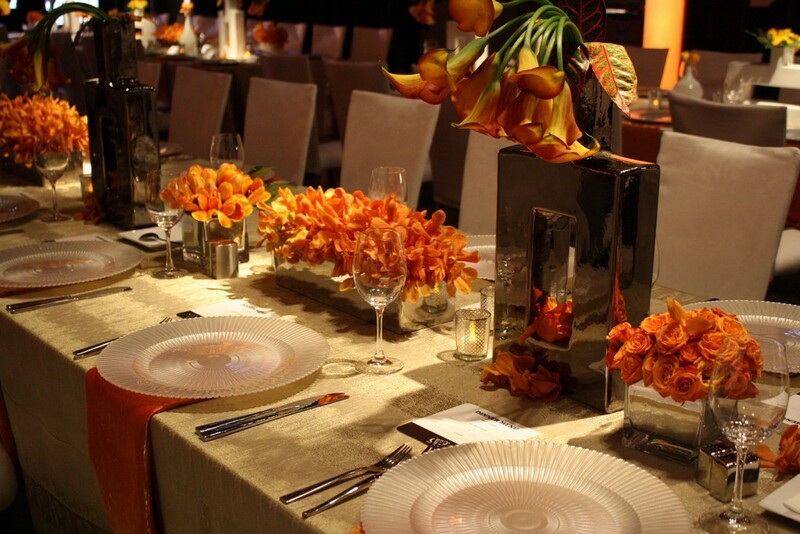 To open up the space and pull focus to the stage, we used royal guest tables that ran the length of the room in three lines. To create contrast and distinction, each line was alternately draped in cream-colored satin sheen textured linens with a vein of champagne gold or silver metallic thread woven through. 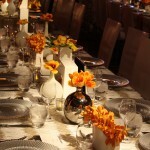 Floral treatments were designed in random shaped modular contemporary ceramic containers of silver and white. 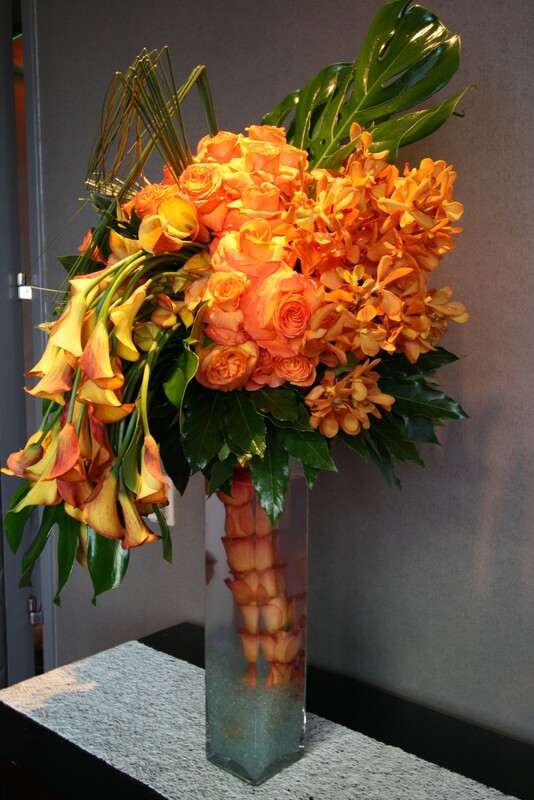 Each was topped with different hues of vivid orange floral including calla lilies, paves of tulips, and Mokara orchids, roses and very minimal greenery. 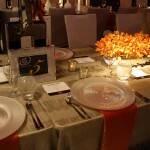 To finish the look, at each place setting, a draped orange napkin was topped with a milky glass Marbella charger. 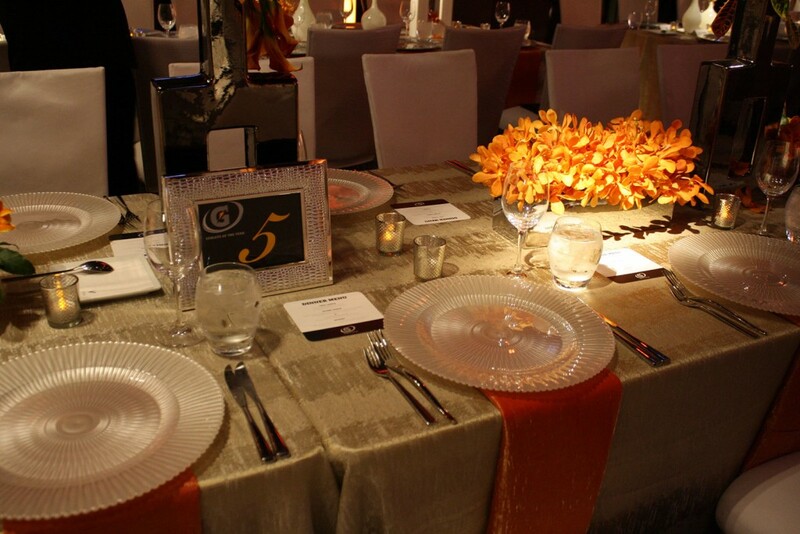 All tables were finished with silver basket weave votive candles and silver alligator patterned frames for table numbers and surrounded by white crocodile chameleon chairs. The flow of the evening started with a cocktail reception and moved into a formal dinner with celebrity entertainment, awards and media programming woven in throughout the evening. 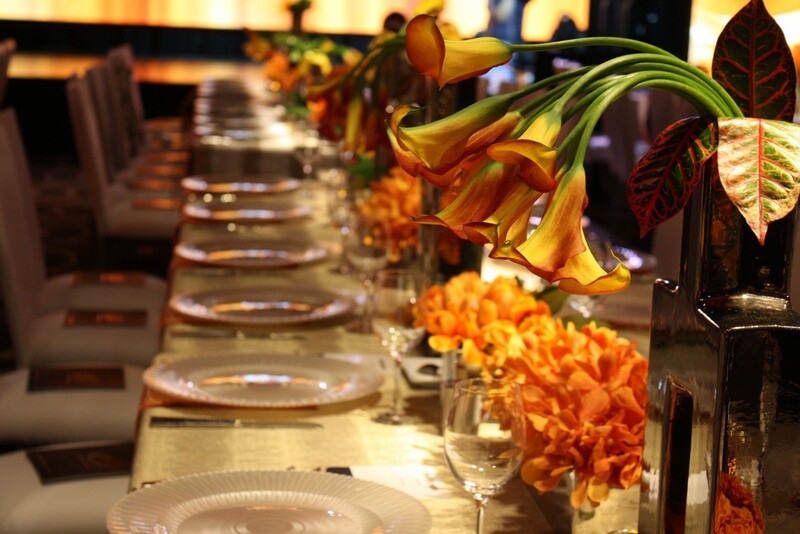 It was an elegantly sophisticated, yet modern look for a room full of A-List athletes and celebrities celebrating the best of the best.